Since I'm a professional blogger now, I decided that I need to use a tool with a bit more functionality than a standard TinyMCE or CKEditor box. Embedding code is just a copy and paste. I can't reference another file and import the code. This means I have to manually update my md file whenever I tweak code samples. THERE ARE PROBABLY SOLUTIONS to these gripes. But what I've found is that I like the AsciiDoc format as much as Markdown, and I like AsciiDocFX way better than MarkdownPad 2. In markdown, what I did was put images into a public dropbox folder, and link to the public URLs. This felt darn hacky, but I couldn't figure out how to get it to point to local files (at least not in MarkdownPad 2). With Asciidoc, I simply specify a local folder with a metadata tag: :imagesdir: images - and that tells AsciidocFX to look for images in that subfolder. To include an image then, I just use image::filename.png[alt text goes here]. And that does it. This is a great feature that I wish I had when I was writing my book. To include a source code file right in your document, just use include::path/to/sourcecode.cs. And then, back in AsciiDoc, use include::path/to/sourcecode.cs[tags=Example1]. Now only the code that sits between those comments will appear in the document. This is such a great feature, because I'm always tweaking code up until the last minute before I publish. Now I don't have to worry about the blog post getting out of sync with the actual code! Not needed for AsciiDocFX. So, even if you decide to stay with Markdown, AsciiDocFX still seems like the superior tool to me. I'm sure there is much more to learn about AsciiDocFX and Markdown, but I'm pretty convinced at this point. I'm going to start using AsciiDocFX for blogging (and, heaven forbid, if I write another book). One of my core motivations for using AOP is that it can bring the single responsibility principle to places that would otherwise be difficult or impossible without AOP. Why is this a good principle? I think that the ObjectMentor white paper on SRP [PDF] sums it up very nicely, but basically if you have multiple concerns in a single class, those concerns become tangled together. This isn't a huge problem until you need to make a change (which never happens in software, right?). If I want to change responsibility A, I now have to involve the code for responsibilities A and B (and C and D, etc). All these responsibilities are coupled. If I make a change, I could break the class in multiple ways, affecting every one of the coupled concerns (unless I have a good suite of unit tests, which is unlikely if I have a very coupled set of concerns). To avoid coupling, a good rule of thumb that I use is to describe what a class does in one sentence. If I have to use the word "and", then it's probably doing too much, and should be split into 2 or more classes. PersonRepository: this class persists person objects to a database. Check! There's no "and", so this class is only doing one thing. BillPayService: this class submits transactions to the payment processor and stores payment history in an audit database. Bzzt! It's doing two things. Maybe I should consider a PaymentProcessorService and a PaymentHistoryRepository refactor. AccountController: this class routes the user to the appropriate account views (and logs any invalid request errors). I'll stop belaboring the point and leave this an an exercise to the reader. Even when following good design patterns and carefully architecting an app, there are some things that just can't be easily decoupled, and that's where aspect-oriented programming comes in. I've been trying on and off to figure out Mono.Cecil, and so far it's not very encouraging. It's a bit above my pay grade, it seems. But all is not lost: I came across a tool while browsing NuGet called FireWeaver. It sits on top of Mono.Cecil, which means it does its work after compilation. It provides you with a way to replace a class with an entire other class. So it's not exactly intercepting or proxying classes, the way other AOP frameworks do: it flat out replaces it and is "essentially duct typing(sic) the entire object definition". I don't know if that's supposed to be "duct taping" or "duck typing", but I rather like the term "duct typing". And here's the output of the console app after I ran FireWeaver. I'm just as confused about Cecil looking at these JustDecompile screenshots as I was before. But I assure you, it does work. There's definitely some potential here, since this is a pretty easy tool to use, and integrating FireWeaver into your build script(s) shouldn't be too difficult if you don't want to hit the command line after every build. And it almost looks like pure duck typing brought to C#. But this could also lead to some really wild code if you aren't careful with it. 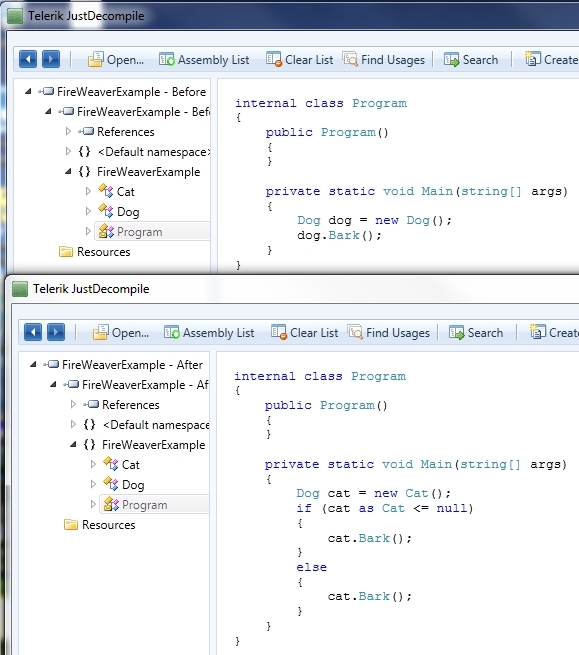 "Dogs and cats living together, mass hysteria" code.